Yuichiro Yamamoto (Japan) arrived in Sierra Leone in March 2017 to commence his UN Volunteer assignment as Programme Officer in Peacebuilding with the Child Protection section of UNICEF. He was fielded through the Human Resource Development Programme for Peacebuilding and Development (HRD). Children in Sierra Leone face a wide range of protection risks, including sexual abuse, domestic violence and harmful traditional practices. Widespread poverty and certain cultural beliefs are major root causes of violence, abuse, and exploitation of children. 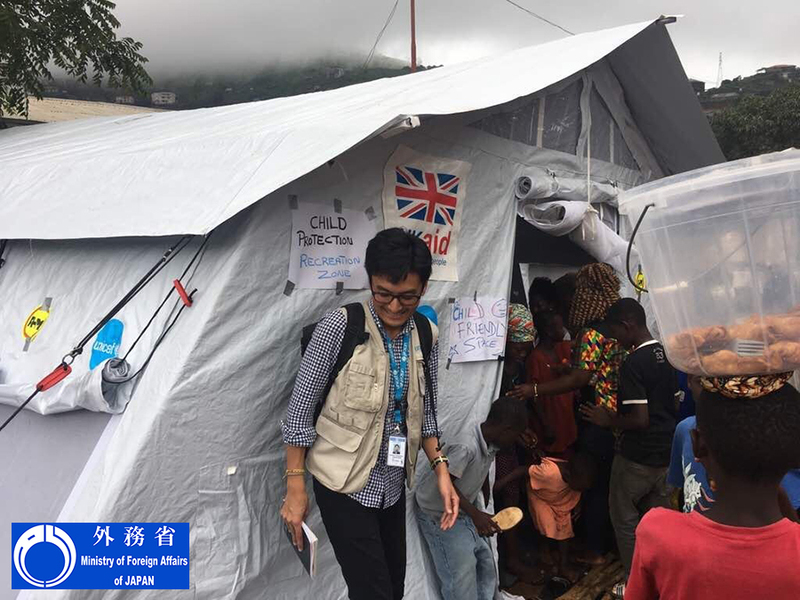 Yuichiro Yamamoto, UN Volunteer Programme Officer in Peacebuilding, serving with the Child Protection Section of UNICEF, Sierra Leone, during the emergency response that followed flooding and mudslides in the country. The situation for women and girls becomes even worse, as the risk of gender-based violence may increase during disaster and displacement settings due to the separation of women, girls, and children from their families, the breakdown of community-based social protection systems, and the affected people having to live in overcrowded holding centres with limited security and a lack of privacy. Yuichiro Yamamoto arrived in Sierra Leone in March 2017 to serve with UNICEF. When the initial peace-building project he was assigned to did not proceed due to a lack of funding, Yuichiro's terms of reference were revised to support the overall planning, implementation, and monitoring of the Child Protection programme. UNICEF quickly mobilized to play an active role in supporting the government to carry out child-friendly interventions to protect the most vulnerable. Yuichiro was appointed Emergency Focal point of the Child Proetction section, leading UNICEF’s coordination response with government, UN, and NGO partners to ensure prevention of and response to violence, abuse and exploitation of children in the aftermath of the floods and mudslides. Prior to the event, Yuichiro had already been involved in the development of emergency preparedness plans for the section, and it was time for action to be taken in the context of child protection interventions. Specifically, Yuichiro worked in collaboration with the Government of Sierra Leone’s Ministry of Social Welfare, Gender and Children’s Affairs (MSWGCA) and partners to establish child friendly spaces (CFS) in six disaster-stricken locations, enabling children to access recreational activities and receive psychosocial support (PSS). Protection desks run by the Sierra Leone Police’s Family Support Unit (FSU) were established in eight locations for identification and response to protection issues. UNICEF also led the family tracing and reunification (FTR) sub-committee to better coordinate the process whereby children who are unaccompanied or have become separated from their families are identified and reunified with their families, or to their previous primary caregivers, as well as a mental health and psychosocial support (MHPSS) sub-committee which bridged the gap between the PSS providers and mental health nurses. Specifically, the MHPSS sub-committee coordinated on-site coaching sessions which clarified and strengthened referral pathways, and equipped PSS providers with knowledge and skills to better deal with cases related to mental health issues and the psychological wellbeing of disaster-affected persons, especially young children and adolescents. The sessions also provided training on stress management support for caregivers, aimed at helping parents recognize signs of their own stress and develop coping mechanisms, and equally recognise and respond to signs of stress in their children. Importantly, over 17,000 children (cumulative) directly benefited from the project by participating in recreational activities and receiving psychosocial support at the CFS, of which 8,525 were girls. A further 2,000 children received psychological first aid, while 75 unaccompanied and separated children were reunited through UNICEF-supported FTR activities. During the emergency response, Yuichiro worked effectively with colleagues in and out of his section, but also externally with partners including NGOs and government to deliver key results in child protection interventions. Despite challenging circumstances, Yuichiro spoke highly of his time at UNICEF as he was able to deepen his understanding of the key principles of Child Protection in Emergencies (CPiE) and refine his coordination skills in the context of emergency settings.